When Purvis Johnson fell on hard times, he agreed to sell most of his land to a real estate developer. Before long, the dirt road that once served as his makeshift driveway became a paved street. Newly constructed houses sprung up on both sides. Families moved in and the quiet neighborhood was on its journey to becoming the suburban utopia promised by the American Dream. A girl goes missing. Detective Robert Stallworth, an Alabama State Trooper known for his ability to find missing things, is assigned the case. As Detective Stallworth and the local sheriff work together to solve the case, mysterious events continue to take place on Johnson Road. One by one, tragedy will strike them all. By the time the dreamers realize they are trapped inside a nightmare, it’s too late. Something has gone terribly wrong inside the dream — something evil — something on Johnson Road. Buy Johnson Road today to discover the truth about who is behind the horrifying events. 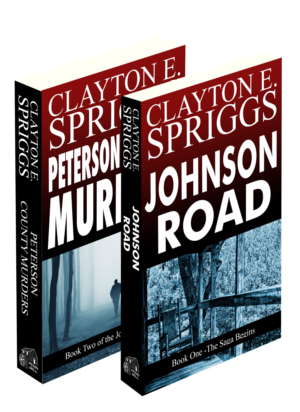 Peterson County Murders is the second book in the Johnson Road Saga, a series of thrilling mystery novels. If you like gut-wrenching twists, psychological suspense, and masterful storytelling, then you’ll love Clayton E. Spriggs’ twisted tale.